Consider all of the work you accomplished in 2016. From January 1 to December 31, think about the projects, meetings, your progress. Now imagine someone told you that your coworkers got their full check on December 31 for all of their similar work, but you have to work until July 31, 2017 to bring home the same pay. This is why today is symbolic. July 31 represents the number of days Black women have to work into 2017 in order to earn the same pay white men earned for similar work in 2016. Let that sink in for a minute. We’re more than half way done with 2017. The facts need to be heard. 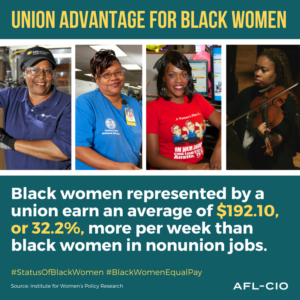 Black women earn 17% less on average than their white female coworkers. That’s 63 cents for every dollar their white male coworkers bring home. For our Latina sisters, the pay gap is even worse. Their pay gap is acknowledged in November. This is outrageous. It’s unfair, it’s wrong, and it’s terrible for our economy. Women lose hundreds of thousands of dollars over their lifetime to this gap in pay. The gap cannot be explained on the basis of education- women are paid less than men at every level of education attained or including benefits in our analysis – women are actually less likely to have employer-provided health insurance and retirement resources. The cycles of poverty, discrimination, and sexism are much, much harder to break than the record for Grand Slam titles. For every black woman that rises through the ranks to a position of power, there are too many others who are still struggling. Most black women across our country do not have the same support that I did, and so they often don’t speak out about what is just, fair and appropriate in the workplace. When they do, they are often punished for it. Unfair pay has prevailed for far too long with no consequence. Through decades of systematic oppression, black women have been conditioned to think they are less than. In many cases, these women are the heads of households. Single mothers. The issue isn’t just that black women hold lower-paying jobs. They earn less even in fields of technology, finance, entertainment, law, and medicine. Acknowledging the insidious pay gap is important. Days like today are crucial to raising awareness not just about the problem, but also about the work being done to fix it. Women of Color have boots on the ground and are bringing about change through collective action. It’s time to follow their lead. Show up to help at their actions. Call your elected official to urge them to oppose ANY shameful “Right to Work” laws that make it even harder to organize at work and negotiate fair pay. Because the evidence is clear: when working women stand together, we crush the gender pay gap. Women of color are leading the charge to end this pay gap. Join their conversation #BlackWomensEqualPay on social media. Listen and learn. Show up and support!